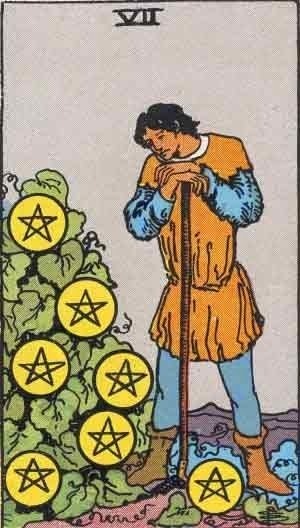 The Seven of Pentacles portrays a young man taking a rest from the difficult work of harvesting his abundant crop. He has been labouring long and hard in his garden. The foliage is full and the blossoms are out. It seems that his work has paid off. He gazes meditatively at the pentacles hanging from the rich greenery of the thicket in which he works and seems to be contemplating the value of his efforts. He is finally taking a break to admire his handiwork and the benefits of his labour.